What’s the sweetest, most delicious, crunchy thing you’ll come across here? Bouchons of course! Created in 1948, Bouchons Vaudois are cork-shaped almond treats, a reference to the wine-making history of this region. Only some twenty confectioners are permitted to make them. In 1948, the Vaud confectioners’ society wanted to create a typically Vaudois sweet treat. The story goes that while the members were having a fondue, the Chairman looked at their bottle of white wine and cried out: “I’ve got it! 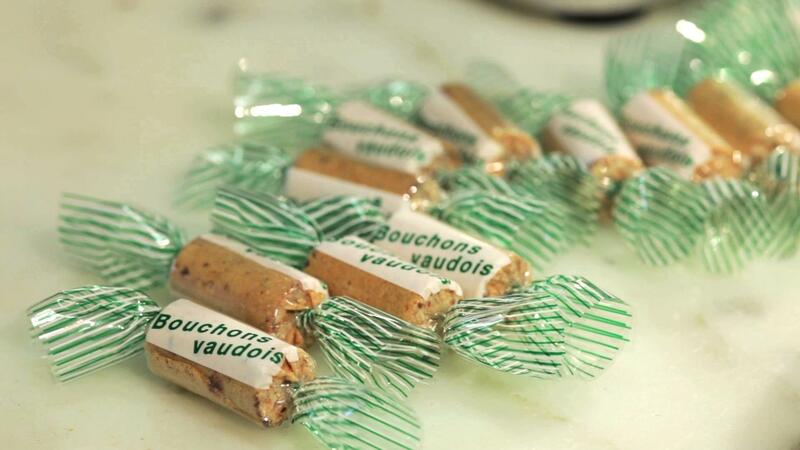 We’ll make Bouchons (corks)!”, to which the other confectioners added “Vaudois ones!” Bouchons Vaudois were born. Still today, only members of the society trained in how to make these sweets are permitted to make and sell them. The ingredients are the same as in the original recipe: almonds, chocolate, egg white and a drop of Bitter des Diablerets. This typical spirit from the Vaudois Alpes gives the Bouchons Vaudois their distinctive flavour. Perfect with coffee, they’re the ultimate treat; loved by everyone, they’re the ideal Vaudois gift!